There is beauty in the “magic” of Santa. In the innocence in the heart of a child that can believe a man can make it around the world in just one night, solely to bless the lives of children everywhere. The story is appreciated and loved because of its wonder, sans the syndical and bitter questioning that sneaks its way into our hearts with age. We use the Santa story to teach our children about the unconditional love that can be found in a gift that is given out of love, not earned like a sticker on a responsibility chart. Once a year, for just a few years, they will wake with the type of anticipation that only lives within a child. They’ll know that awaiting them under the Christmas tree decorated with holy cards will be humble presents, right next to the manger that’s present all through Advent. The gifts won’t be there because they have earned them or they deserve them, just because they are loved – similar to the baby Jesus who will be placed in the manger that sits under that Christmas tree. There is no “naughty” or “nice” list and Santa works in his workshop year-round making toys for boys and girls because St. Nicholas inspired him to be loving and kind to children out of the goodness of his heart. There is no danger of our children learning one day about Santa and drawing a parallel to Christ – thus dismissing the resurrection as a fable, myth or moral story. We talk about Santa from December 7th to December 25th every year. We talk about the baby Jesus everyday. My biggest concern that comes along with being a “Santa family” is not a spiritual one. We’ve got three daughters in this home. Teaching them to sit on an old man’s lap, tell him their secret desires and then take candy from him doesn’t really coincide with what we generally teach our daughters about strange, odd looking older men! Then, on Christmas Eve, we’ll celebrate Jesus’ birthday and while we are sleeping he’ll sneak into our home and we’ll leave him a snack? It is rather amusing when you think about the details. Gold chocolate coins, an ornament to celebrate the year in the life of our family and a new book of stories of the Saints have appeared on our fireplace! 3 little gals are going to be so blessed by St. Nicholas’ visit in the morning. This entry was posted in Christmas, faith, family on December 6, 2011 by admin. Your mantle looks GORGEOUS!!! 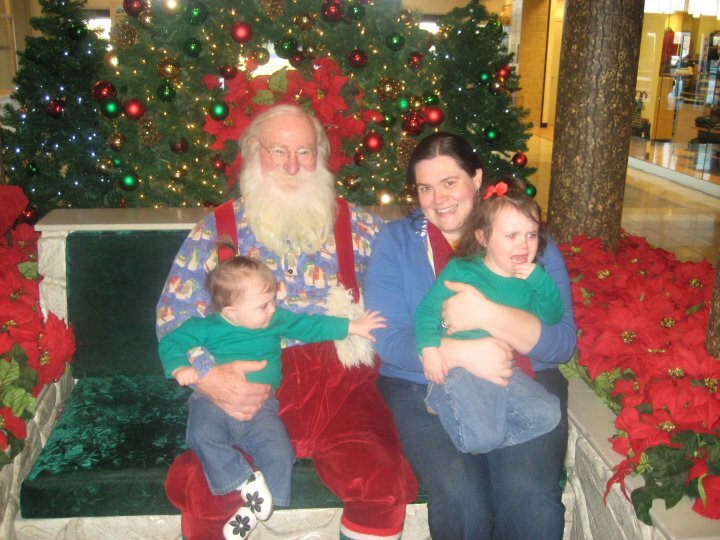 I love the pictures of the girls with Santa–so funny! Great post, as always. 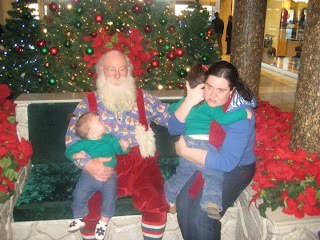 We’re going to be a “Santa family” too. K and intakes and talked about it and decided that it’s a part of our childhood we don’t want our children missing out on. However, we’ve changed things up a bit. I grew up dirt poor and K grew up much more well off. I didn’t get much but I also never expected much. I was happy with what I got. K on the other hand got everything on his list. He came to expect this. Fortunately though, due to his personality, he didn’t let this go to his head too much. When I began teaching I saw than many children get everything on their list and then some. Children that I knew came from very poor families were getting iPods, new laptops, $200 shoes and more. It boggled my mind and I saw how ungrateful these kids became. It was so sad. They will get 3 gifts from K and I. We’re going with the “if it’s good enough for Jesus, it’s good enough for them” idea. Then they will get their stockings from Santa. We figure as they get older there may also be some joint gifts (games etc.) thrown into the mix. We want them to experience the joy and excitement of Christmas morning without losing the true meaning and going into debt. Besides, I’m sure their grandma is going to go overboard anyway. Perfectly said. I totally agree that Santa can be done in a very beautiful and loving way without being hyper focused on gifts and make believe. We’re in! We woke to filled stockings this morning too! And a randomly timed lit tree! We’re going to believe in Santa, but celebrate him as St. Nicholas on the feast! I loved all things Santa growing up and I still love the spirit of generosity, but I want to seperate it out from all the gifts on Christmas. I want to make it its own special day. It was so neat to see Clara’s big eyes this morning and hear the stocking come tumbling off the fireplace. We are a Santa family, a St. Nick family, an Advent family, a Christmas family…. I think you get the picture and I LOVE. YOUR. LOGIC. Thanks for sharing how your family celebrates. My son just turned 3 and I feel like this was a pivotal year for us. 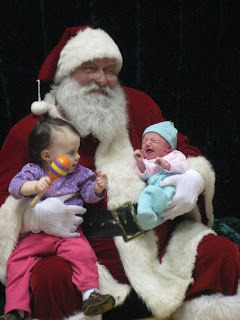 Prior to this year, he didn’t know Santa existed and he might not have known if his cousins hadn’t told him this year. I was reading the advent book “Joy to the World” and the author explained why she thought it was okay to include secular traditions including Santa. Her reasoning was that Jesus loved children more than anyone and what he loved was their excitement, innocence, and faith. I envisioned Jesus with all the little children celebrating and I realized that it is okay to include Santa so long as we truly understand the true meaning of the season and we put greater focus on that. 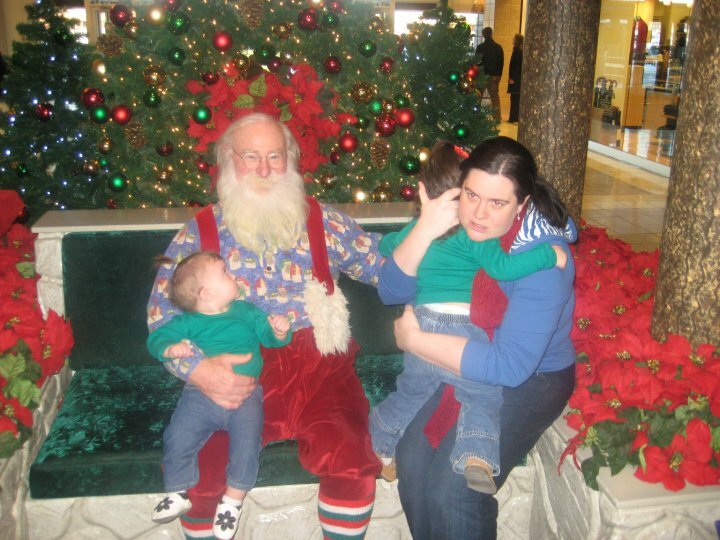 I am with you on the “sitting on Santa’s lap” thing though. I’ve never actually taken my kids and probably won’t. Even when we talked about St. Nicholas, my son had trouble sleeping thinking about someone he didn’t know coming into our house. I wrote about this same subject on Dec 5th! I agree with you, it’s what we make of it and how we portray it to our children. Holly, I LOVE this line: “We talk about Santa from December 7th to December 25th every year. We talk about the baby Jesus everyday.” Amen! Santa comes to our home as long as the kiddos believe in him. When you quit believing, he quits coming. Or something like that. I think the whole Santa thing doesn’t bother me like it does some Christians and others because of what you said here. It’s not an emphasis forever. It’s just a story we share once a year for a while. And there is good in stories if we tell them in the right way with the right spirit. God bless you, Holly! Visiting from Catholic Mom online. I also love the idea of a Santa. When the kids get older and ask too many questions, or no longer believe the ‘trust the magic’ lines then we tell them how much mom and dad are a part of the story. After knowing more they are allowed to help on Christmas eve with putting each child’s 3 pre-wrapped by mom, gifts under the tree and to fill stockings with candy. We talk about how the spirit of giving and of love Christ is behind it all. I don’t understand why so many well meaning Catholics forgo this fun American tradition. There are so many ways to add the Spirit of Santa with the truth of St. Nicholas and St. Wenescels into the story. Happy New Year! I finally did something today I’ve been meaning to do for a long time – read your posts. I really enjoyed catching up with what you and your family have been doing and find beauty in your gratitude for what may seem like small, insignicant things to some people, as well as your gratitude even in times of uncertainty (like on your anniversary this last year). God bless you and your beautiful family!